April 27, 28, 29, 2018: Featuring All Street Rods! 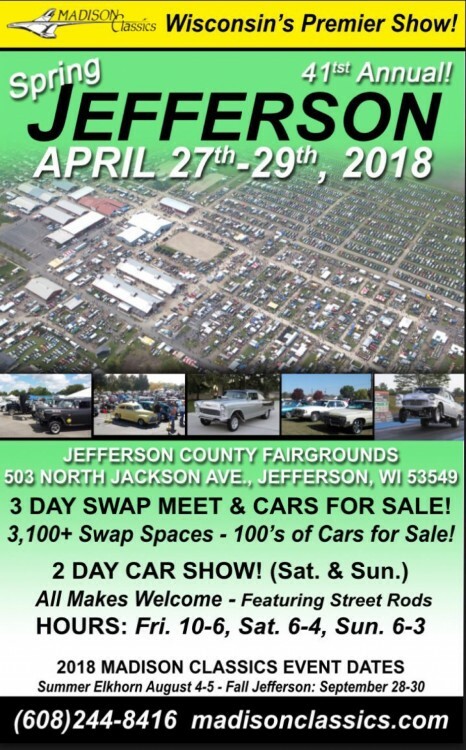 Our 41st annual Spring Jefferson Swap Meet & Car Show will be held April 27, 28, 29, 2018 at the Jefferson County Fairgrounds located just off Hwy 18 at 503 North Jackson Ave. in Jefferson, WI. The featured vehicle will be all Street Rods; however, all makes and models of show vehicles are welcome. Come join all the fun at the Spring Jefferson Swapmeet and Car Show! Spectator admission is just $10.00 per adult. Spectator parking at the fairgrounds is $5.00. No pets, please. Children under the age of 12 are free with paying adult. The car show has 100's of awesome show cars and special interest vehicles that you'll definitely want to check out! Please note the car show is Saturday and Sunday only. The price to enter the car show is $10.00 per adult in the vehicle. Children under 12 are free when accompanied by an adult. Make selling your car parts and car accessories easy by vending at the Spring Jefferson Swap Meet and Car Show! Be sure to register early, this is an extremely popular swapmeet! Pre-registration for swap spaces closes April 1st and spaces will be available at the gate the weekend of the car show at an increased price. Prices vary based on the size of the swap space. All space dimensions are approximate. Vendors must have at least 80% auto related products for sale and those who cannot meet our criteria will be asked to leave. Vendor set-up begins on Friday beginning at dawn and closes at 7:00 p.m. sharp. ** Some additional sizes are available although limited. Please call for details. All sizes approximate. Cars for Sale Corral - 100's Vehicles For Sale! Cars for Sale Corral spaces are available ahead of time or the entire weekend of the car show at the Cars for Sale Corral gate. The price to enter a vehicle in the Cars for Sale Corral is $60.00. This price includes admission for the driver all weekend. There are no vehicle age/make/model restrictions in the Cars for Sale Corral. Non-running vehicles left on trailers will be charged $120.00. Oversized vehicles will be charged accordingly. The price is the same if you choose to attend one day or three. Does not include separate parking fee for tow vehicles or spectator admission for additional occupants in the vehicle. Hours: Friday 10am, Sat-Sun 6am.